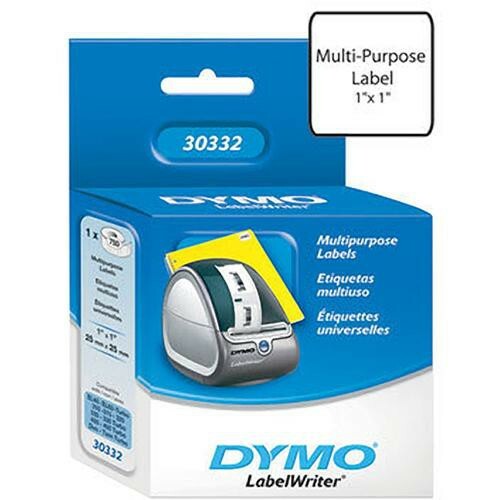 The Small Multi-Purpose Labels from Dymo are designed for use with their line of labelmakers. One roll is included, with 750 1 x 1" labels, appropriate for a variety of applications. Simply print, peel, and stick the adhesive labels to whatever you desire. Box Dimensions (LxWxH) 5.2 x 3.6 x 1.35"
Small Multi-Purpose Labels (1 x 1") is rated 5.0 out of 5 by 1. Rated 5 out of 5 by Anonymous from perfect labels We use these labels to tag our merchandise with product codes. They are small and fit perfectly on the hangtag. B&H had the best price. Shipping was quick.